Jacob: Why I Guide, I love the outdoors, really crazy about whitetails and I have a big passion for putting guys on them that never killed a big buck. That's it. It's the chase and the "what if," I guess. Travis: Now, that is number one stud puppy. Travis: Jacob...got a kicker on it. I didn't know you had that kicker. Jacob: Yeah. It's just something about having guys that you don't really even know that great. And by the end of a six-day hunt, a lot of times you end up really good friends. You know? Definitely not doing it for the money, I'll tell you that. But it's a lot of fun, meet a lot of new people. And instead of me hunting in one stand by myself in a week's time, I've got 8 or 10 guys in a stand. It's just cool to feel like you were part of the hunt. 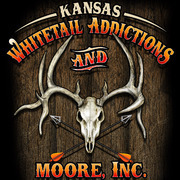 Ashley: I've never met anybody any more passionate about whitetail. He wakes up thinking about it, he goes to sleep thinking about it. Jacob: That was good shooting. Tyler: Thank you. Appreciate it. Jacob: I watched that kind of tracking job. Ashley: He lives for it, you can tell. And I never understood that in the beginning and now I do. He's always thinking of the next step and what he can do. And the really cool part is that he's passionate about putting somebody else on a whitetail. Jacob: It's kind of a family thing. My dad, my mother, and my wife, and now a little girl, just all part of the outfitting business. Travis: It's kind of a family unit and you see that when you're here. Ashley: He's told me that his uncle and his dad really instilled in him what to look for and how to wait for a trophy whitetail. Jacob: These Kansas deer, they just grow big here. And I'm obsessed with trying to put clients on them. Man 4: That was him we smelled, ain't no doubt. Good job, man. Jacob: I won't never have another dog like this one. Ashley: I think it's super exciting because at any moment you can see a giant come around any corner. Jacob: Terrain here is prime for bow hunting for whitetails. It's kind of rugged terrain and a mix of open country with thick timber and brushy draws, cedar thickets. Travis: Jacob has a knack for, from what I've seen, is, you know, he's real good at reading these canyons. And he just... something about these Kansas deer. They're big and he just loves big deer and they're here. Jacob: This is cattle country. If there's a gate closed when you get to it, make damn sure you close it back. Some guys are gonna come in talking about all the deer they're seeing and some of you ain't gonna see very many. Believe in us. We see a lot of deer out here because it's open country but there's not near as many deer. Some of you are gonna see a lot more than others because of food sources and different things. Some of you hunting travel corridors. You're not gonna see as many. We're not looking for numbers unless it's inches. Terry: I've hunted all over the country and I've hunted with numerous outfitters. And in my opinion, Jacob is by far the best outfitter I've ever hunted with. He always tries to be open, he always tries to tell you, "Look, you know, I've got a good deer coming in here. I think you need to hunt here. We got the right wind for it." Jacob: It looks pretty good in here. Quite a few pictures on the card and I just checked it a few days ago. Looks like there's some pretty big tracks in here. Pretty good buck? Travis: Yeah...I think what makes Jacob stand out is he's a bowhunter and he gets it. Jacob: The native grasses are very high in protein. We're in what they call the Flint Hills. It's full of brome and bluestem grass. It's just as high in protein as alfalfa is. Lenny: Dang good buck. That's the kind of buck, you know, you come to Kansas for. Terry: The pressure-filled days, you know, when people are killing deer is great but when people aren't killing deer can be very tough on an outfitter. He can't control the weather, he can't control the conditions outside and the stage that the deer are in. Jacob: I've always wanted to be an outfitter since I was a young fellow, like, not even a teenager yet. A lot of deer die from old age out here. I truly believe that no human ever lays eyes on. It's a big country and the resident population, there's not enough people out here to bother them. I mean, they live in this open country and in these big draws and stuff and they get the age on them they need. We use a lot of trail cameras, get a lot pictures. It's a lot of work but we keep cameras going almost year-round. Keeps it interesting for me, especially. It's kind of like Christmas every time I go to check the cards. Terry: We keep coming back to Jacob year after year because the bottom line is, he puts us in the deer. End of story. Great video! I have known Jacob for many years and know his passion for big whitetails. If you are thinking about KS, give Jacob your 1st look!